Photo: Courtesy of The Kitchy Kitchen. Pictures of Kim Kardashian and Kanye West's wedding cake are not yet circulating, but we feel pretty confident we've found a baked masterpiece to upstage it — no matter how over-the-top it was. 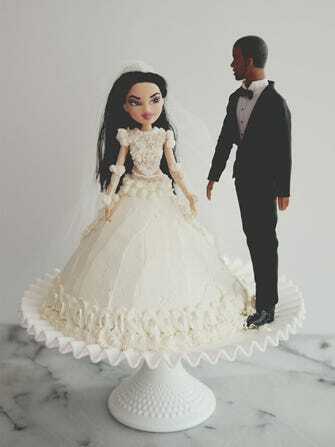 Behold, the Kimye Doll Cake. We know, the likeness is quite eery. (Who knew Kim had a Bratz doll made in her likeness?) In fact, the couple should really be kicking themselves for not recruiting the talented Claire Thomas (author of the blog The Kitchy Kitchen) to create their big-day sweets. Lucky us, Thomas whipped up this exclusive bridal doll cake that captures the exquisite gown and tuxedo to a T. The details, from Kim's train to her intricate sleeves, make us feel we as if we were actually there. Only better, because we can eat this version. For a couple that's just a tad self-obsessed, it might be the perfect one-year anniversary dessert. After all, it's at least as delicious as Kanye is talented. Click to page two for Thomas' tasty tutorial. 1. Preheat the oven to 325ºF and set the oven grate to the second-to-bottom rung. 2. Mix your batter per instructions. Assemble and grease your pan (I just use canola oil spray), fill the pan about 3/4 of the way (you will have batter left over). Carefully set the cake pan in the oven and bake for 60 minutes. Test the cake's doneness with a toothpick, and go very deep in. If the cake needs more time, keep checking on it at 5-minute increments. When the cake is done, take the pan out of the oven. Let it sit on the counter for 15 minutes, then invert onto a cooling rack. Let it cool completely. 3. Slice the bottom of the cake with a knife, so that it stands flat. Set the cake onto a cake platter. 4. Combine powdered sugar with water until thick and easily spreadable. 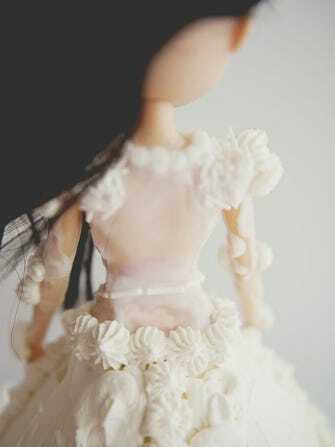 Using a toothpick, paint the doll's bodice and arms. While the sugar is still wet, decorate with sprinkles and pearls. I did pearls around the top collar, sprinkles in a V on the front, and sprinkles as a belt around her waist. Carefully set the doll aside for the bodice to dry. 5. Prepare the frosting per the recipe's instructions. Cold frosting works best, so I recommend chilling it in the fridge for 15 minutes. Pop the pastry tips in the pastry bags. To fill, I put each bag in a tall glass, fold the bag over the edge of the glass, and scoop the buttercream in. This helps keep your hands clean and gives better control. Push the buttercream to the front of the bag, twist the back of the bag, and you're ready to go! 6. Cut off the doll's legs at the knees (I know, it's awful. I wince every time, but they won't fit in the cake otherwise. ), and push her into the top of the cake. I always push from her head down, so as not to disturb the bodice. 7. Spread frosting over the cake in one layer with a butter knife or spatula, and then get going on the details. I did little swirls all over the base of the skirt and just below her waist. Then, I added some on her arms to tie it together. Have fun! Finally, sit back and enjoy the #WorldsMostTalkedAboutCake.